This was the kind of movie that as it went along I grew less and less fond of enlisting in, its emphasis on facts and detailing the chronology of the battles at Guadalcanal forcing me to retreat in the face of a withering assault on my entertainment senses. I’ve got digital cable so I’m pretty sure that if I wanted, I could hit channel 566 or so and come up with a World War II Channel where they run documentaries about the Greatest Generation twenty-four hours a day. What I need out of my war movies is lots of drama about the glory of our boys where they triumph against all odds and destroy the Death Star or whatever the big operation is supposed to do. If I wanted to hear a day by day account of how they sat around waiting to get bombed or lived for the day the mail arrived or wondered if the Yanks would beat the Cards in the ’42 Series, I’d go down to my local VFW Hall on bingo night. 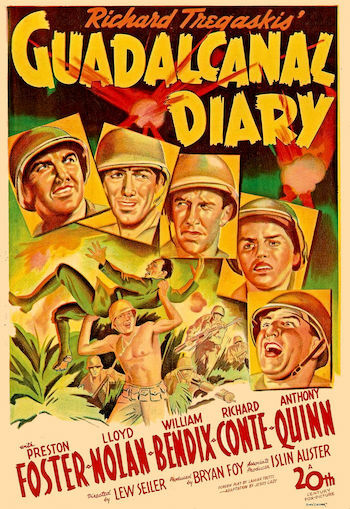 Guadalcanal Diary had the makings of a classic war movie, what with it being loaded down with a platoon of stars and familiar faces. More importantly, the characters all these guys played came with the kind of nickname you’d need for a Dirty Dozen-style mission where the enemy gets outfoxed by our clever gang of misfits, outcasts, and outright psychos. Thus we had Anthony Quinn as Sooze, a Hispanic guy who was running multiple gals back home. There was William Bendix (The Glass Key) as Taxi, a guy from Flatbush who lived only to get back home to Ebetts Field to watch his lovable Bums from Brooklyn. Hook was the older leader of the gang, played by the fatherly Lloyd Nolan (Peyton Place), while Richard Jaeckel, who appeared in The Dirty Dozen itself years later, was the young kid called Chicken (cause he was just getting his feathers or something). I was thinking that with a crew like Sooze, Taxi, Hook, and Chicken that this movie couldn’t miss. All that was left to do was wind them up and let them loose in some plot that probably involved going undercover as German officers and blowing up a mountain fortress. Then the movie begins and a narrator starts blabbering on and it quickly becomes clear that this isn’t going to be one of those movies where the MPs have to break up fights between our boys on the eve of the big mission when they’re all in some little French village getting drunk. Instead the film goes to great pains to be “authentic” (well, as authentic as you can be when you’re storming the beaches of the Santa Catalina Islands in California), concentrating on portraying events as they happened for the most part instead of portraying events that allow guys like Frank Sinatra or Richard Burton to blow up Nazi trains loaded with gold and the Lost Ark and stuff like that. The mission is to hit Guadalcanal to give the Japanese a receipt for that little stunt they pulled in Hawaii eight months before! As the landing draws near, our boys are nervous, yet resolute. Finally, it’s go time! We hit the beach and…nothing! 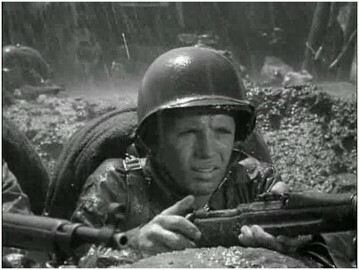 The boys move up from the beach to the airfield they’re supposed to take and find that the enemy left in a hurry. As it turns out, the Japanese didn’t already give up. They’re just hiding out in the hills and in the caves on the island and aren’t above such cheating as killing guys in the middle of the night when no one is looking! Word comes from a Japanese prisoner that a group of his comrades are holed up somewhere else on the island and are starving and ready to just give up to the first American G.I.s they see. A group of soldiers are detached to check this out, but once they hit the beach and start running inland, the Japanese open fire! The movie then becomes a progression of battles, waiting for reinforcements, mail call, and getting the piss bombed out of us by Japanese planes and warships. 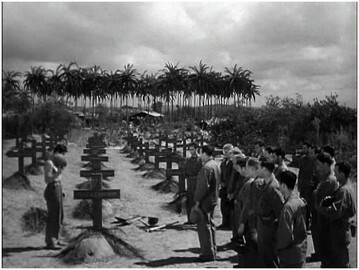 This movie came out in 1943, less than a year after the events it depicts. The book it was based on was apparently a big hit with the American public since they were pretty peeved with the Japanese bombing Pearl Harbor and were looking for some evidence that we were getting some payback after problems in the Philippines and Guam. 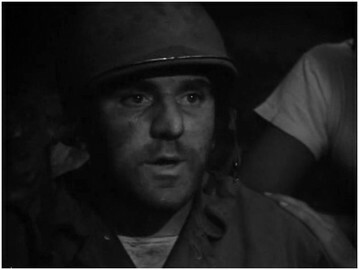 It’s probably understandable then that this movie would be more of an accounting of how we did on Guadalcanal rather than a typical drama where you’ve got characters that are central to the story and as far as that goes, the movie does fine. It dramatizes some of the major events, doesn’t glamorize war or the guys over there fighting it (in fact, it goes out of its way to show that they’re regular guys who just want it to be over and come home), but more than seventy years later, it comes off as a bit dry. It’s solid propaganda for the time, but if you want a fact-based retelling of what went on there, I’m sure there’s been documentaries made about it. If you’re looking for war-based drama with any depth to the characters, you’ll need to look elsewhere as well.